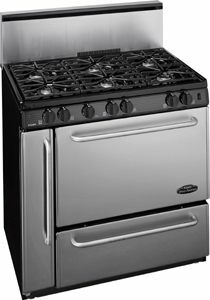 Gas ranges may not exactly be alternate energy, but many of our customers cannot find a high quality gas stove that does not need a lot of power to operate. Most new gas ovens have a "glow bar" that draws 300 to 400 watts of power the entire time the oven is on--quite a big battery drain! This is a safety feature that makes certain the flame does not go out, and prevents the oven from being used in the event of a power outage. A range with spark (electronic) ignition uses only 2 watts for a few seconds. The pilot will light automatically with a 120VAC connection. Without AC power, all burners and the oven can be lit with a match--the old fashioned way! These ranges ship from Belleville, IL; please allow four to six weeks for delivery. Select A Link Below to View All Models and Features For The Size Stove You Are Interested In. -10" high stainless steel backguard. 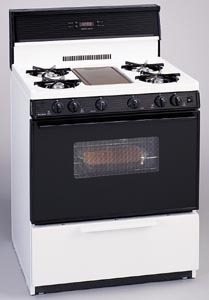 -Easy Conversion From Natural to L.P.
Options include gas pilot or electronic (spark) ignition; sealed burners; continuous cleaning; solid oven door versus windowed oven door; black porcelain oven door. Backguard options include 4" porcelain; 4" stainless steel; 8" porcelain w/ electronic clock; 10" tempered glass with electronic clock; 10" decorative glass; 10" decorative glass with battery clock/timer. 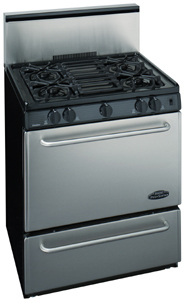 The 30" and 36" models offer griddle and 5th burner package, and the 36" model offers 4, 5 or 6 burners. Colors available are white (no additional charge), black or almond ($20 additional). The more options you get, the more costly the unit becomes, but the reverse is true. 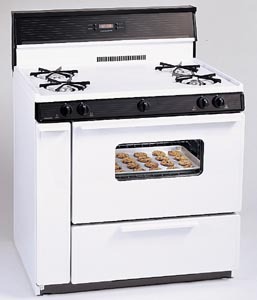 A 'plain Jane' version of the 30" unit, for example, white with four burners, electronic ignition, and 4" porcelain backguard is $500 before freight. We've got some nice pictures of these units; let us know the size you need (20", 24", 30" or 36"), and we'll mail you additional information to help you ascertain what options best suit your kitchen. White units are generally in stock; almond or black may take longer. 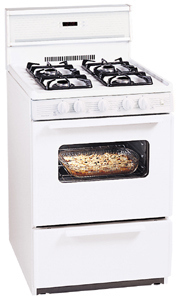 Call for your freight costs on these quality, long-lasting gas ranges. Any Peerless-Premier model number beginning with the letter N or the letter P (manufactured prior to April 2012) contains mercury in its oven safety valve. This is not at all a hazard in a working oven. However, if you have one of these models that is no longer working, and you wish to dispose of it, please check out the following website: http://www.premierrange.com/faq-mercury.php. Here you will find instructions on how to recover the mercury-added component. The disassembled component can then be shipped to Peerless-Premier, where it will be properly recycled.